Yeah, but: Its 15:9 aspect ratio matches nothing. The Long Version: One of the shortfalls of digital photography is that the photos never go anywhere. It was easier to flip through a box of prints from the Olden Days than it is to sort, index, and find digital images - especially when the computer's off. Since I've taken most of the family photos over the past few years, that meant that they were buried in the tens of thousands of photos on my hard drives, and Penny would never see them. The addition of this digital frame has completely fixed that problem, and makes the whole Digital Photography thing much more fun and sociable. 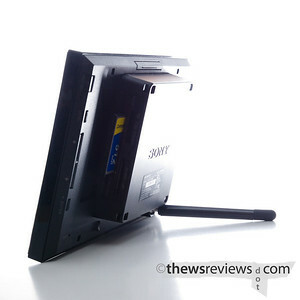 The Sony D70 frame cost more than the other 7" frames on the shelf, but its display was noticeably better than the others at the big-box store. It was also the only frame that supports the Compact Flash memory format - thank you, Minolta, may you rest in peace - which let me re-use some older cards instead of buying a new one. The D70 does have some decent built-in memory, but I find that it's easier to move a card to the frame than the frame to the computer. (I've been using Sneakernet longer than the Internet.) Since the actual size of the photo can be quite small, hundreds of them will fit on a memory card that's far too wee for my cameras to feed, or in the internal memory. All told the small amount of extra money was very well spent. Being a Sony product, the digital picture frame also has a calendar and clock built in, which look great and work well. There are different slideshow modes, and plenty of options for sequencing and dwell time. The looks of the frame itself will work equally well in an executive office or a modern living room, and it's even possible to shut off the bright-white Sony logo that's lit in the bottom of the frame. Some people might like the tech-bling, but I wouldn't have bought it without the brand-neutered option. My only real complaint about the DPF is the funky 15:9 aspect ratio. Me being me, I had to re-crop over 400 photos to get them to fill the display. All of the nine digital cameras in the house have 4:3 sensors, and if I crop them I usually recut them to the squarer 8:10 or 11:14 to match my print sizes. I suppose I could go on a rant about Sony's obsession with having a 16:9 ratio crop built into its Cybershot and Alpha cameras, and the hoax of a "Full HD" logo that they put on the camera boxes, but the reality is that pretty much all of the 7" digital frames on the market have the same ratio. It's probably just the best way to get a decently sized LCD panel at a price-point that people will buy. And once I had adjusted my photos, I've actually come to like the abnormally wide ratio. I like photos, and get pretty serious about them. I had never taken the idea of digital frames seriously, but this Sony has converted me. I bought it for Penny so that she'd have a way to see the personal photos that were somehow never 'worth printing', but would love to have a second one just for my 'artwork'. After all, there's plenty of it that's never worth printing, too. When bigger digital frames reach my price point I plan to use one or two for gallery shows instead of framed prints. This way I can display many more photos while taking up less wall space. The Sony frame has been on the end table for nine months now, and we still look at it on a regular basis. It has faded into the furniture background a bit, but not nearly as much as the wall-art has. I've even added more photos to it a few times.